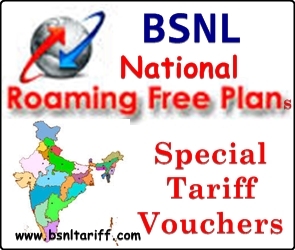 Telecom-Backbone Bharat Sanchar Nigam Limited (BSNL) launched two new ‘Roaming Special Tariff Voucher in in South Telecom Circle of Karnataka under GSM Prepaid Mobile Services. The Special Tariff Voucher of Rs.5/- offers, Local/STD Outgoing calls at 1.5 paisa per second and all the Incoming calls are ‘FREE’ with validity for 1 day by following all other charges according to the Prepaid Base Plan. In continuation to the above following other charges will be according to the Prepaid Base Plan. The above Two Free incoming roaming STVs will be implemented with effect from 15-07-2013.